When my girlfriend and I decided to dress up for Halloween this year, we definitely wanted to make our costumes ourselves. We figured we wanted to do something cute and simple but we wanted to make sure we looked good. Adam and Eve was one of our first choices and we stuck with it. Little did we know though how much fun these costumes would be to make and the attraction they would bring on the night of the Halloween Parade in New York City. 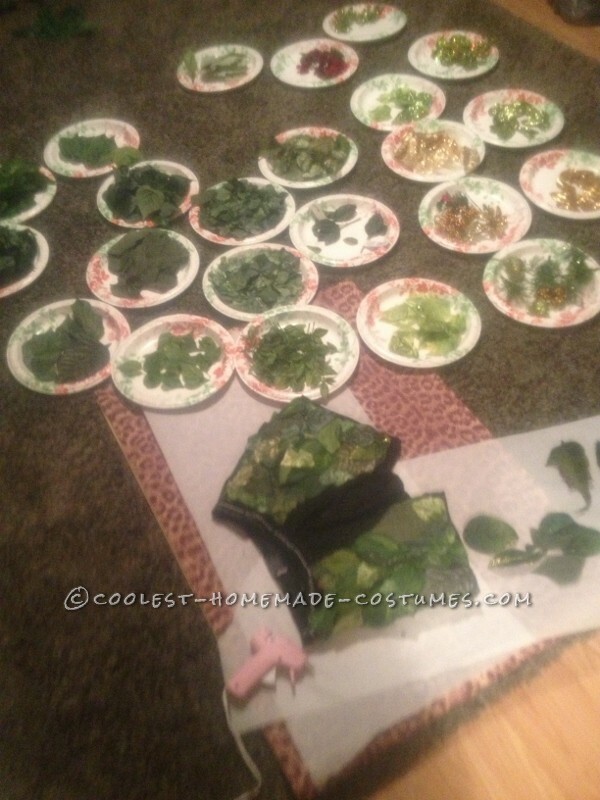 We started off by purchasing a wide assortment of fake leaves from Michael’s Craft Store. We ended up investing more than we anticpated, but the time it took to create and the effort we put in really paid off in the end. We picked off every leaf from every different plant we bought and organized them on paper plates to see what we had to work with. After countless patterns and arrangements, and also many blisters from the hot glue gun, we came up with our designs. We wanted to make the costumes sophisticated and not just put a leaf on our private parts as did our predecessors (Adam and Eve) but we also wanted to catch some sort of sexiness in them. Adam’s costume was more simplistic though more random than Eve’s costume. 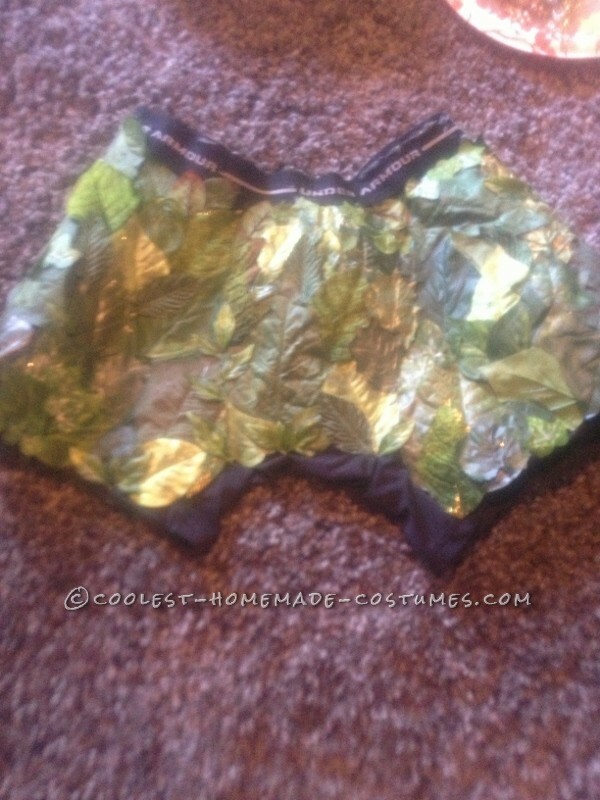 We took a pair of underarmour boxers and glued the many leaves we had in random patterns for the most part. Branches and vines were wrapped around the waist and the legs to give the random pattern more structure so the costume would look more complete. Adam’s shoes were made out of flip flops in which leaves were glued to the tongs to give them a natural look. The costume was completed with an arm tassle of leaves to emphasize that look of sexiness we were looking for as well as the infamous serpent wrapped around Adam’s body which we found lurking at Toys R’ Us. Eve’s costume embodied more elegance and was more glamourous then the Adam costume. 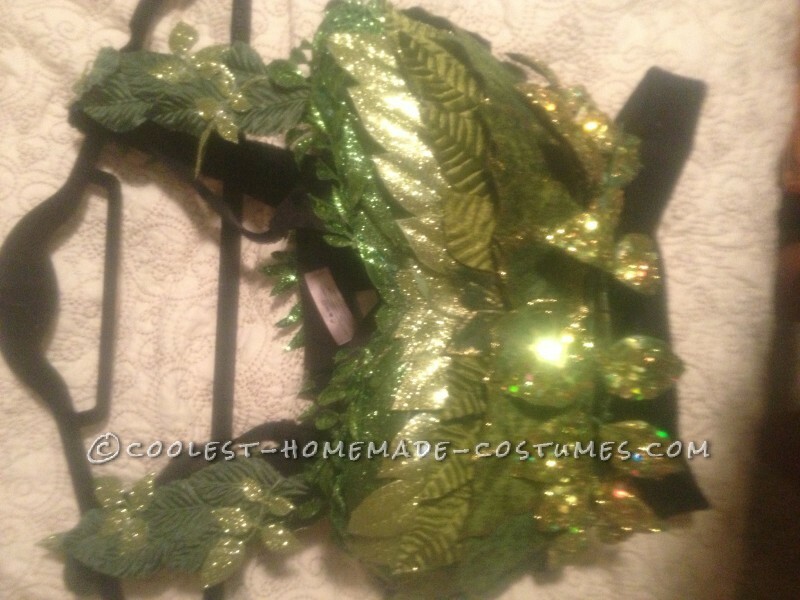 We used a black bandeau for the top and glued numerous styles of leaves which mainly included studded leaves and glitter with a hot glue gun. 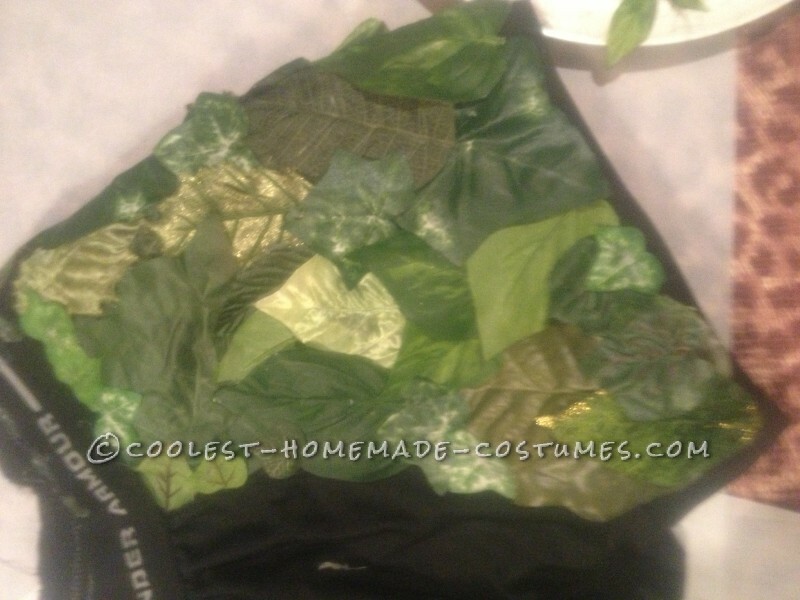 For the bottom, we used a pair of black booty shorts in which we did same although we incorporated more plain leaves to try and make it couple with Adam’s costume more. We wanted to keep the femininity of Eve in the costume. For Eve’s feet, we used flats and glued some more leaves on them because obviously she wasn’t going to walk in the city barefoot. 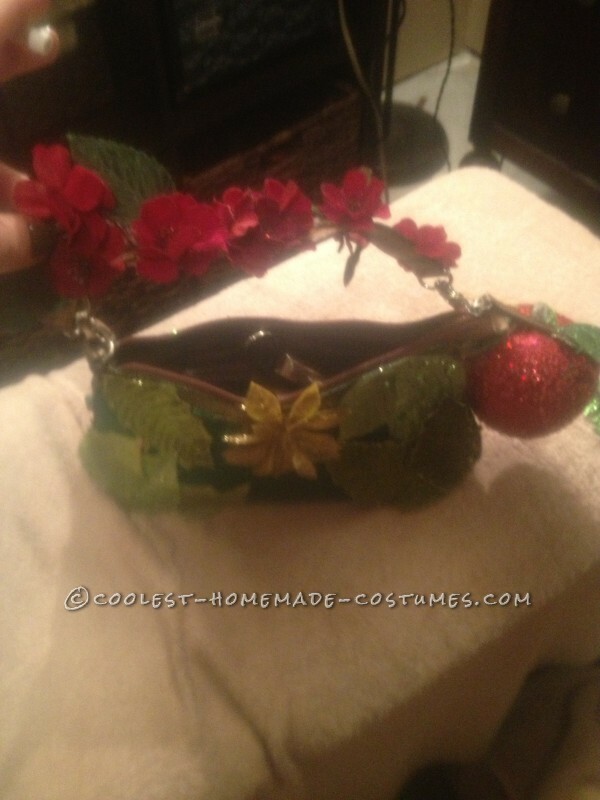 We also spray painted in green glitter a small handbag which we glued a few leaves on as well as hung an artificial, sparkling apple which we alsopurchased from Michaels to match the costume and really emphasize the Adam and Eve theme. We finished off the costume with a few butterfly clips in her hair and an eccentric eye tattoo that included a leaf design. Overall it was a very in depth costume to say the least. It was a little stressful at first but once we started we didn’t stop and actually had a lot of fun making it. We didn’t realize the kind of success and appreciation we were going to get for it until the night we went out. There were many great costumes out there but I really feel ours ranked among the top. We never thought we were going to have so many people complimenting us or wanting to take pictures with us as we did that night. There was a time where we had about 15 people taking pictures of us with camera phones and professional cameras. I felt like we were on the red carpet. We felt like we were celebrities! This is something we had never done before together or in general and it really pretty much gave us a new hobby. Now we really can’t wait for the next Halloween and have already started thinking of ideas to outdo ourselves this year. Based on our performance this year, I think we hit Adam and Eve spot on so I guess the apple really doesn’t fall far from the tree does it?